The SETTINGS>Global Helper Permissions page controls what helpers can see and do at WhenToHelp when they sign in using their individual helper username and password. When helpers sign in, they see a different interface and can only view Published schedules. 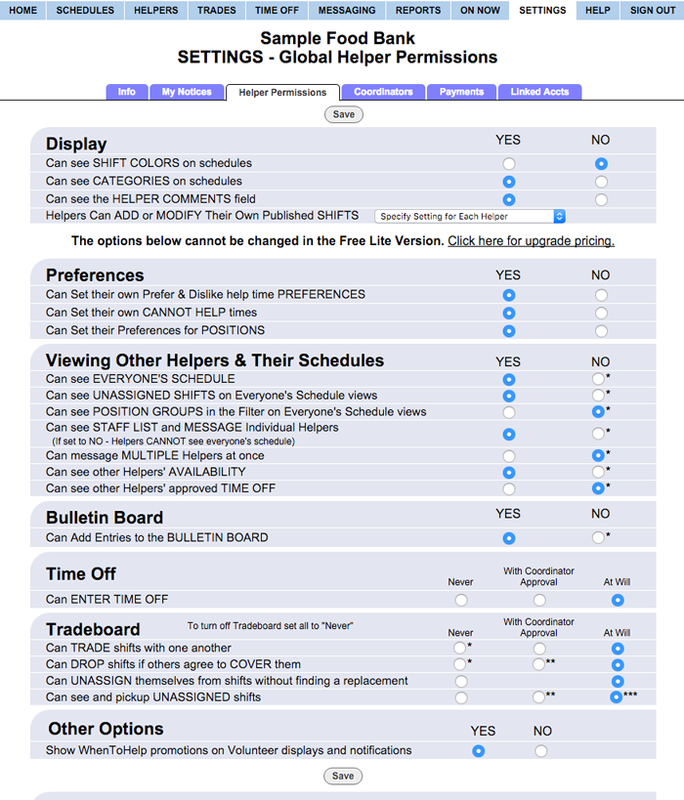 To see an example of the HelperView, you can sign in live to see a sample organization helper account (http://WhenToHelp.com/testdrive.htm) which has most helper permissions and features turned on. After publishing your first schedule, you also can sign in as a helper in your account (in "read only" mode) to see exactly what your helpers will see when they sign in. Use your SETTINGS>Global Helper Permissions page to set what Helpers are allowed to see and do when they sign in. If you allow helpers to see Everyone's Schedule, you also can control how each of those views appear using your own "Change Layout" link on the account's main coordinator corresponding Schedule View, i.e. Helpers will see the same layout that the main coordinator sees. If you upload an organization logo from your SETTINGS>Info page, the helpers will see your organization logo on all of their pages and printouts.